Here you'll find various titles of welding books. Some are specifically for the pipe fitting trade, others are designed for general purpose welding. 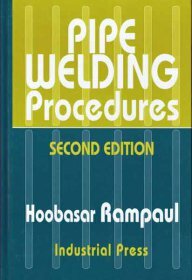 One of our most popular welding titles is the Pipe Welding Procedures. We well it to some technical schools across the US. The Art of Welding is a welding book that was written in collaboration with Ryan Friedlinghaus of West Coast Customs. Take a look at the information withheld in these books and see if they are of use to you in your endeavors.